Caitlyn Freitas is the Associate Editor for NIA. Her responsibilities include curating, editing, and writing content for Insulation Outlook; working on marketing and outreach pieces; and editing all NIA publications. She can be reached at cfreitas@insulation.org. In March of 2015, Coast Guard veteran Casey Jones opened Fair Winds Brewing Company with one goal in mind: to create exceptional craft beers for flavor-conscious customers. One year later, Mr. Jones is proud to say that Fair Winds has made a name for itself in the craft brewing world. They have already won a regional award, a national award, and became the first large-scale packaging brewery in Fairfax County, Virginia. The first batch of their Howling Gale IPA won the distinction of being named the best IPA in Northern Virginia by Northern Virginia Magazine, and they also won a gold medal for their Siren’s Lure Saison at the prestigious Great American Beer Festival (GABF) in Denver, Colorado. GABF, founded in 1982, is the premier beer festival and competition in the United States, and its public tasting event and private competition comprise the largest collection of American beer ever served. This year, GABF offers attendees the option to try more than 3,500 beers from more than 700 of the country’s best breweries. Winning the best Saison category is an impressive accomplishment for any brewery, let alone a small, independent brewery in its first year. Both of these award-winning beers are available at Fair Winds’ facility in Lorton, Virginia, which houses both the brewery and a commercial taproom for tastings. The construction of Fair Winds was unique to their vision for operating an exceptional brewery. Brewing the beer—or rather, preparing the wort solution for the yeast to ferment into beer—is a multifaceted process that requires precise temperature control, which relies in part on properly insulated equipment. 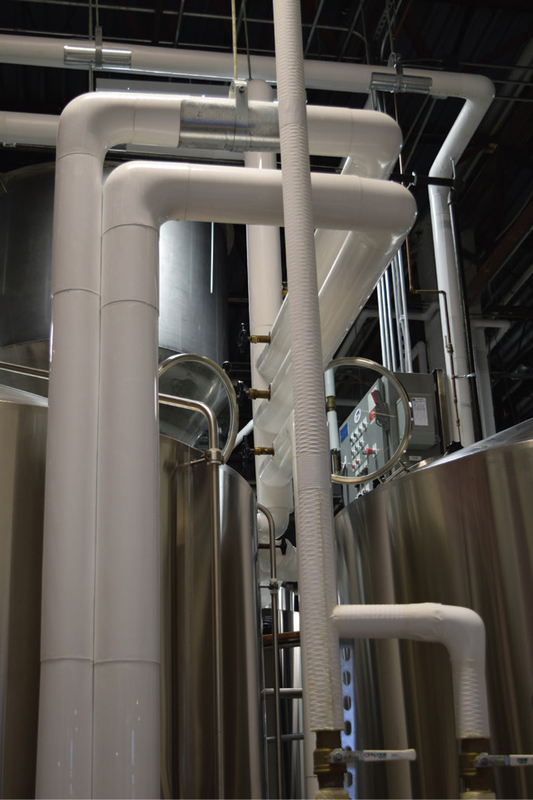 Brewing requires both cold and hot temperatures and therefore different insulations were used throughout the facility, including fiber glass with traditional all-service jacket (ASJ), fiber glass with PVC jackets, PVC elbows and fittings, elastomeric, and mastics on the valves. 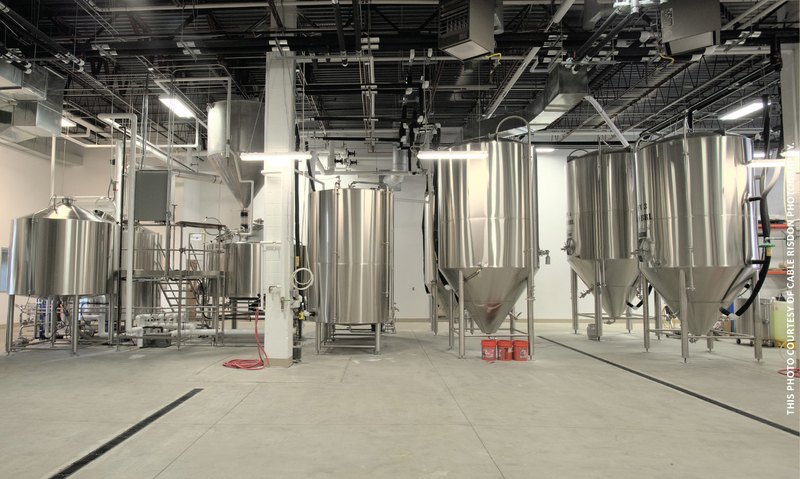 Correctly specifying insulation in a brewery is crucial to ensuring that the brewer is able to precisely control each aspect of the process—leading to an exceptional and consistent final product. To build the brewery, Jones enlisted the Russell Gage Corporation, a general contractor with experience building breweries and distilleries. The owner, Russell Gage, has constructed several breweries and distilleries in the Washington, D.C. metro area. Gage, who calls his company, “the brewers of breweries,” commented on how this process requires careful coordination between the equipment, heating and cooling systems, plumbing and insulation, water supply, drainage, and electrical infrastructure. 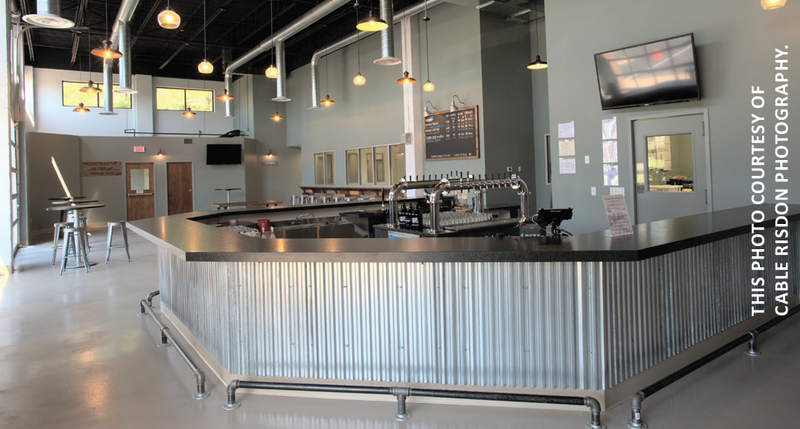 Gage added, “The success of a brewery begins with the architect and general contractors fully understanding how a brewery operates on a daily basis.” Jones and Gage looked toward the future when designing the systems, and added plumbing and piping for future tank growth. They expected it would take a 5 or 10 years to use all of their capacity, but due to their beer’s popularity, they have already added new tanks and are set to begin local grocery store distribution. The process of brewing begins with the grains being crushed in a grist mill, and then steeped for approximately 2 hours between 140°F and 160°F in the mash tun, where temperature is managed by introducing hot water into the mash to extract the starch—the most important fundamental building block for creating the wort. Once the starch is extracted, the next step is to convert that solution into the simplest sugar possible, which is called wort. To accomplish this, the starch is put into a brewer’s kettle, where it is boiled for about 90 minutes. All the lines that carry steam to the kettle are insulated in order to protect personnel from high temperatures, and also for increased efficiency—uninsulated lines have to work harder to maintain temperature, lessening the system’s efficiency. The kettle also has steam jackets on the bottom, sides, and center to transfer steam heat to the wort. Once the solution is broken down into sugar, it is “whirlpooled” to remove extra particulates and make it a clean solution for the yeast. Then, a heat exchanger, which uses insulated lines, is used to “cold crash” the solution by dropping the temperature from approximately 212°F to 70°F as quickly as possible. The heat exchanger uses clean water to allow the brewery to control the temperature by exchanging the heat, then the water is transferred via insulated lines to a holding tank to be recycled as cleaning water, thereby reducing the brewery’s water-use footprint. At this point, the process is shifted from the hot-house side of production to the cold-house side, also known as the “kitchen” or “cellar” side. This is where yeast is introduced and beer will be made. As with the former process, temperature control is critical on the cold side, as temperature affects the ending flavor of the beer. When yeast consumes sugar, it aspirates 3 primary things: bubbles (carbon dioxide), giggles (alcohol), and heat. The temperature must be carefully controlled on the tanks to balance the desired level of bubbles, giggles, and heat. Brewers use different temperatures to achieve different flavors and craft different beer styles. If the tanks become too hot during fermentation, it can drive fruity flavors, including banana, into the beer—which may or may not be desirable depending on the type of beer that is being produced. To control the fermentation process, which can take anywhere from 7 to 21 days, glycol wraps are used. The tank is structured to be an outer vessel and inner vessel with glycol running in between to control temperature; all the piping that runs the fluid to the tanks and chiller are insulated to help maintain temperature and protect personnel from potential injury. 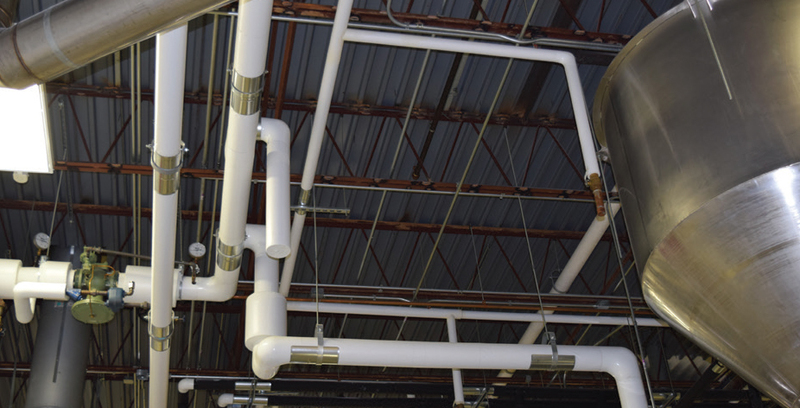 The glycol lines are covered with elastomeric insulation, which is able to withstand moisture. In addition to the glycol, each tank has a solenoid that controls temperature. In addition to the need for a highly controlled temperature process, there is another factor that requires breweries to carefully specify appropriate insulation and jacketing: frequent hot wash downs with caustic solutions. The sugar involved in the brewing process can present the risk of mold growth, which can contaminate the beer and lead to severe production issues. To mitigate this issue, the equipment needs to be washed down using a caustic solution that can be as hot as 190°F. Additionally, the high humidity inside the brewery makes water-vapor transmission—which can get the insulation wet and endanger the equipment—an ongoing concern. Insulation in these conditions also serves an important role in providing freeze and burn protection. Cold lines carrying coolants can be as cold as -28°F. They must be insulated in order to prevent ice from forming on the pipe exteriors, which can rob the system of energy and thus efficiency. Uninsulated lines also present a personnel safety issue, as they can possibly freeze skin if left bare. Similarly, hot piping—including all the lines that carry steam from the boiler to the boil kettle—can be a personnel safety issue if left uninsulated. Without the proper insulation, the system will also have to work harder to maintain the appropriate temperature, lessening the system’s efficiency. For these reasons, all of the hot and cold lines in the brewery are insulated. Properly specified and installed insulation is critical to the processes that enable Fair Winds to produce its products and maintain a safe working environment. Craft beer has elevated the average consumer’s understanding of hops and malts, but many of those customers may not be aware of the role that properly insulated equipment plays in creating the perfectly balanced beer. Without the temperature control that insulation offers, the head brewer, Charlie Buettner, would not be able to pick and choose flavors to craft everything from hoppy farmhouse ales to dark, robust stouts. Fair Winds Brewing Company offers kolsch, IPAs, ambers, stouts, and their golden colored, gold award-winning Saison: Siren’s Lure. The knowledge and expertise of craft brewers such as Buettner is crucial in brewing outstanding beer—but temperature and insulation also play an important role in creating humanity’s favorite beverage. This article was published in the March 2016 issue of Insulation Outlook magazine. Copyright © 2016 National Insulation Association. All rights reserved. The contents of this website and Insulation Outlook magazine may not be reproduced in any means, in whole or in part, without the prior written permission of the publisher and NIA. Any unauthorized duplication is strictly prohibited and would violate NIA’s copyright and may violate other copyright agreements that NIA has with authors and partners. Contact publisher@insulation.org to reprint or reproduce this content.